The purpose of the Task Group is to develop a document that addresses the role of a Radiation Safety Officer (RSO) in the Radiation Protection Program (RPP) of a medical facility. 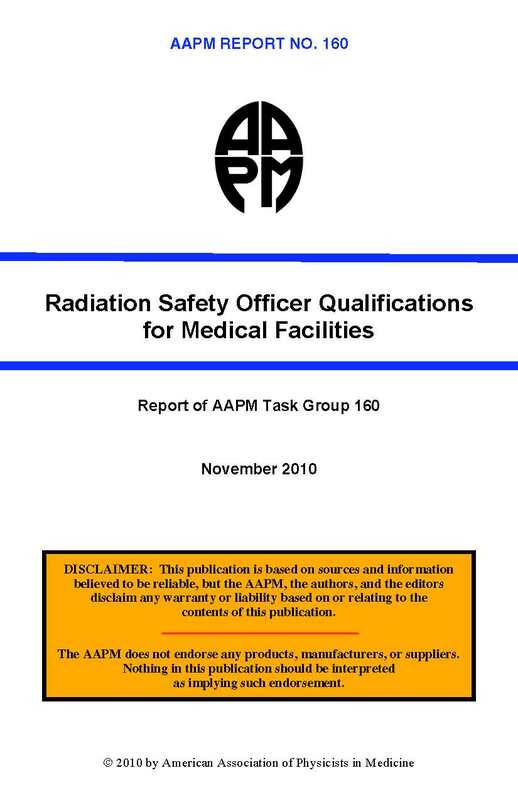 The document includes a discussion of the authority, responsibility, and duties of the RSO and the radiation safety responsibilities of other members of the facility’s “radiation safety team” from facility management to the supervised individuals who work directly with the ionizing radiations. The regulatory training and experience requirements for an individual to function as the RSO are summarized and guidance is provided to assist facilities man- agement when adding an individual as an RSO on a license. The document discusses RSO qualifications based on facility size and the scope and complexity of ionizing radiation use and the role of medical physicists and other medical professionals as an RSO.